I recently read an informative article educating manufacturers on how to have PPC (pay-per-click advertising) success despite selling capability rather than stock products. One of the tips given in the article is to “monitor search queries for both organic search and PPC.” I think this is good advice, but everyone may not know how to do this, so here’s a brief tutorial. The entirety of the Search Engine Land article is copied here after the tutorial, too, so you can read all about how to have PPC success. To monitor search queries for organic search, go to your Google Search Console (aka Webmaster Tools). Don’t have one? This is a good time to set one up. Contact me if you need some assistance. how you appear in search results, your mobile site performance, and much more. 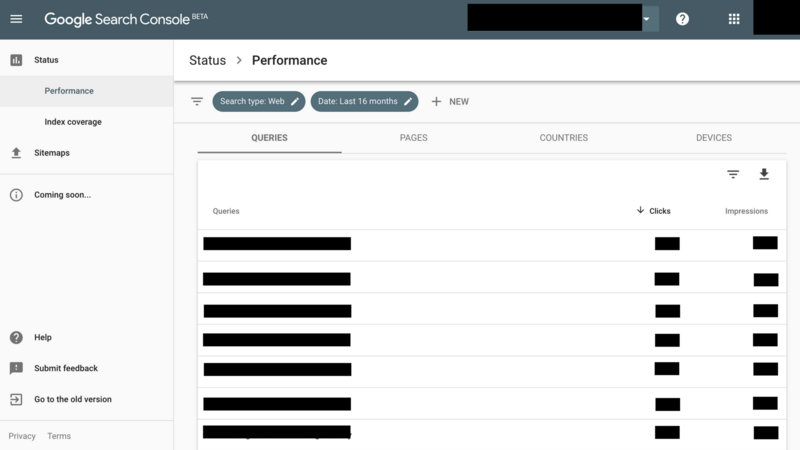 To monitor your organic search queries, simply select “Performance” from the left-hand navigation and scroll down to see “Queries”. These are the phrases people are searching that are currently causing your site to appear on search results pages. 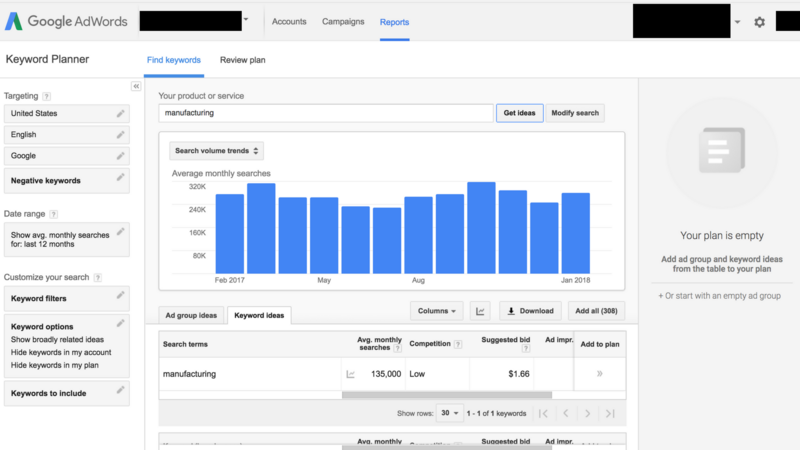 To monitor search queries for PPC, go to Google’s Keyword Planner. If you already have an AdWords account set up, you can get to the tool by clicking the wrench in the upper right on the main navigation bar. Select Keyword Planner from the drop-down. If you don’t have AdWords, you can still use the Keyword Planner by going to this site. Choose “Find new keywords and get search volume data” to explore alternatives to keywords you might already have. Enter your keyword in and you instantly get a long list of terms and how often they are searched. You can even narrow down the geographic area to your city or state. While running a successful advertising campaign can be complex at the best of times, it presents a special challenge to small industrial manufacturers. It’s one thing to advertise a widely understood product, such as a running shoe or blender, to a large consumer market. It’s another thing entirely to sell a manufacturing capability that’s only really understood by those in the industry — especially when products look and function differently based on the specifications of the buyer. This challenge is particularly pronounced in the world of search engine marketing, where industrial manufacturers must adapt to an ad platform (e.g., AdWords) that seems more geared to retailers. My company, Huff Industrial Marketing, faced this challenge with a manufacturing client. I’m pleased to report that through carefully and patiently running a variety of experiments, based on different approaches and ideas, we’re now seeing good results. In this column, I’ll share how we did it. The client is in the business of making specialized machine parts used in a variety of manufacturing processes. Because each part is custom in size, type, material and so forth, what this client is really offering is the capability of making these specialized products. In other words, they don’t make “stock” products sold off the shelf. This immediately created a conundrum with the PPC advertising campaign — namely, how in the heck do you advertise a manufacturing capability to buyers in dozens of industries? Eventually, we came up with a solution that encompassed three critical PPC elements: keywords, messaging and landing pages. Almost immediately, we knew that keywords were going to be a problem. One challenge is that terminology used in manufacturing is often specialized and used as “jargon” inside a company or industry niche — but may not be fully understood or used by buyers across the myriad industries or markets that exist. Consequently, searches on these terms often return irrelevant results. For example, when I conducted a search on a specialized type of manufacturing wheel, it returned results for car wheel rims and bike wheels — which wasn’t at all what I wanted (Figure 1). Unfortunately, this didn’t seem to be something that Google’s machine learning could correct. So, what to do? When we went too broad with our keywords, the ads ended up displaying with irrelevant search results. (Of course, we worked to mitigate this with negative keywords.) If we went too narrow, then search volumes were too low. Eventually, what saved us was monitoring search queries for both organic search and PPC. Based on the data, we realized we had to stop thinking in terms of “capabilities” and start thinking in terms of “end products” — even when those end products weren’t standard. Then, we marketed each end “product” individually through separate campaigns and ad groups. As an aside, the client, too, was surprised at the terms buyers were using to source specific types of products. It’s been a real eye-opener for everyone on the team and has led to the client looking at new ways of marketing custom items they’ve been manufacturing for years. We also took a closer look at our ad messaging — in particular, the calls to action. If you’ve looked at PPC ads generated by industrial manufacturers, you’ll know it’s not unusual for these ads to include calls to action like “Free RFQ” or “Get a free quote!” in the ad body or sitelinks. Initially, we followed the lead of other manufacturers and included similar calls to action in the ads. We realized very quickly they weren’t converting. When we thought about it more deeply, we realized that this kind of messaging didn’t make sense. In other words, prospects needed to talk to someone. So, we revised the ad copy — and landing pages — accordingly. At the same time, we reworked the landing page to remove any unnecessary navigation and competing calls to action. This task was made significantly less onerous with the help of our web developer, who was able to reconfigure the client’s code and add simple “click to remove” options. This allowed us to remove the main nav, footers and so on by simply checking a box. With this capability, we didn’t have to rely on a third-party landing page service, which saved the client money and also kept the landing pages on the client’s domain. To top things off, the development team added the script for Google’s phone call conversion tracking, where Google dynamically changes the phone number on the landing page, allowing for tracking of desktop calls. With these changes in place, we were quite pleased to see four “in-the-ballpark” form inquiries and four phone calls in the first five business days. Inquiries have continued to stream in at a good pace. Focus on your business and sales process versus what other manufacturers are doing.It’s very easy to fall into the trap of “everyone else is doing it so it must be working.” Nope! Study your data and then experiment with different approaches until you see the results you want. Rethink what you’re selling. For many small industrial manufacturers, what is being sold is a capability — often to create highly specialized parts that go into bigger systems. Monitor organic and PPC search queries to see what terms potential buyers are using to find you — and let those queries be your keyword guide. Don’t give up! It’s very easy to become frustrated with AdWords (believe me!) when you’re spending money and seeing little, if any, return. Continually read the AdWords help files to understand how things work, find a good developer who can help you with tricky things like coding and tagging, and experiment. With patience, you will find a combination that works for you. Get great marketing advice in your inbox about once a month! Get valuable marketing strategies and tips that you can actually use!